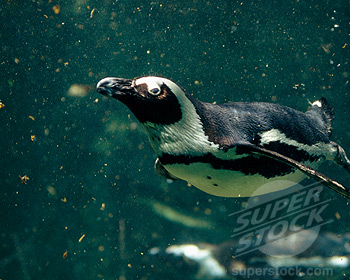 Animal Wildlife | African Penguin | The African penguin is a small to medium sized penguin species that is found along the coast of South Africa and on a number of it's surrounding islands. 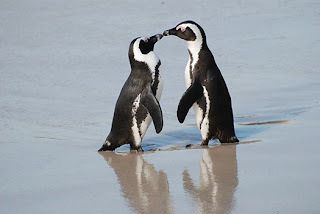 The African penguin is thought to be most closely related to the Humboldt penguin and the Magellanic Penguin found in southern South America and the Galapagos penguin found in the Pacific Ocean near the equator. The African penguin was named for the fact that it is the only species of penguin that is found breeding on the African Coast. 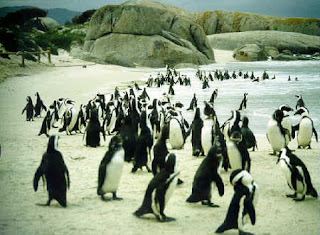 The African penguin is found on the south-western coast of Africa, living in colonies on 24 islands between Namibia and Algoa Bay, near Port Elizabeth, South Africa, with the largest colony on Dyer Island, near Kleinbaai. The African penguin is a fairly distinctive species of penguin with clean black and white markings and a sharply pointed black beak. 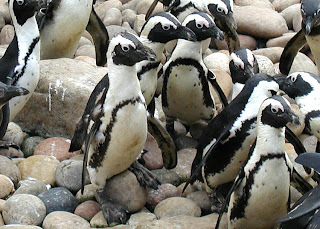 The African penguin also has black feet and a number of dot-like markings flecked across it's white chest which are said to be as unique to the individual penguin as a human finger print is. The male African penguin is generally slightly larger than their female counterparts but both are fairly similar in appearance. 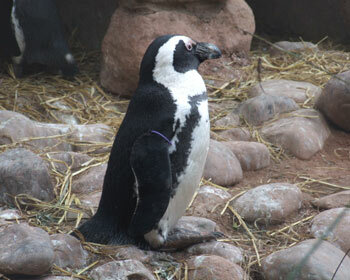 One of the African penguin's most distinctive features is that they have pink glands above their eyes. The hotter the African penguin gets, the more blood is sent to these glands so it may be cooled by the surrounding air, which in turn, makes these glands more pink. The African penguin is a carnivorous animal, that like all other penguin species, survives on a diet that is only comprised of marine animals. Krill and small crustaceans make up the bulk of the African penguin's diet along with larger organisms including squid and various species of fish. 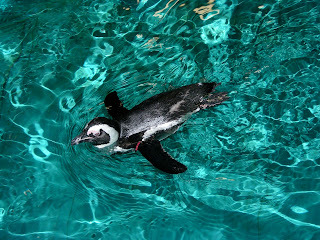 Because of the African Penguin has smaller size, it has many predators both in the water and also on when they are on dry land. 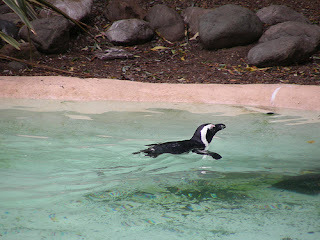 On land, the African penguins must keep a keen eye out for crabs, snakes, owls, and hawks, while in the water they must avoid sharks, fur seals, and sea lions along with killer whales and the odd shark. 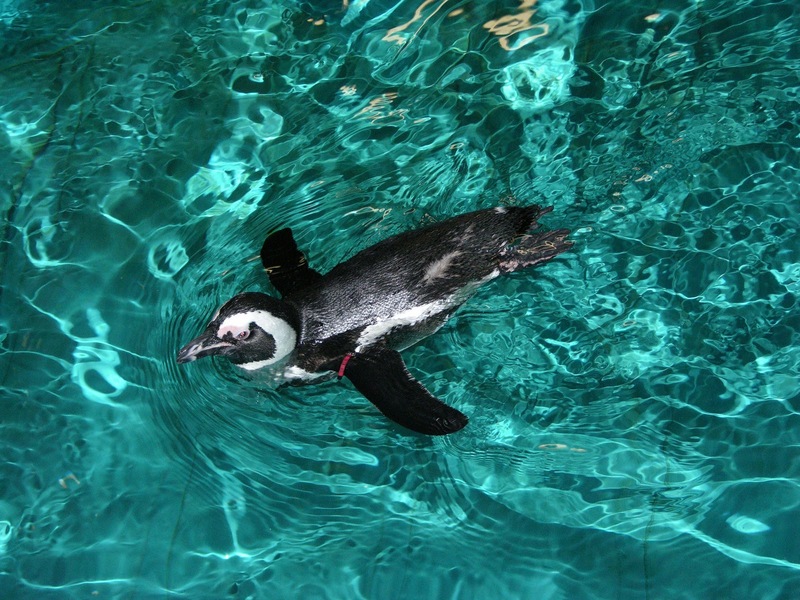 The African penguin has also been severely affected by human activity in their native region. On average, the African penguin breeds once a year, forming pairs that usually remain faithful to one another. The female African penguin lays two eggs which are incubated by both parents for up to 40 days, when only one of the eggs will usually hatch. The African penguin chicks are fed and kept warm by their parents and remain with them until the chicks are nearly a year old. 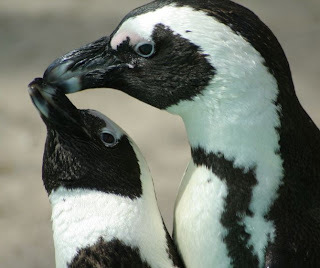 Today, the African penguin is considered to be a vulnerable animal that was hunted to near extinction at the beginning of the 20th century by humans, and their eggs were also harvested on mass meaning that there were very low rates of reproduction. The species is now protected in specific areas. 0 Response to "African Penguin"